Posted on Wednesday, August 28th, 2013. This is a script for Safari. It’s a variation on my Bookmark in Yojimbo script. 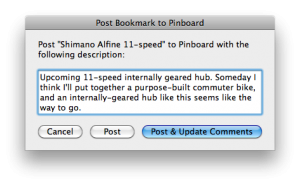 The original “Bookmark & Edit” option has been replaced with “Bookmark & Post to Pinboard”. 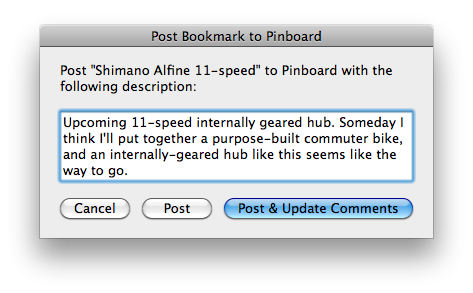 I rarely want to edit a bookmark or its properties, but soon I might start sharing some links on Pinboard. This is a script for NetNewsWire, a free feed reader for Mac OS X. It works just like the above script for Safari. It saves a bookmark to the current news item, and provides an option to spread the news by posting the bookmark to Pinboard. This is what I’m going to do instead of sharing items in Google Reader. This is a script for Yojimbo, the program I use to save bookmarks and other bits of information. 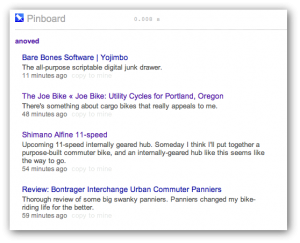 It posts the selected bookmark items to Pinboard. This script is invoked [and thus required] by the “Bookmark & Post to Pinboard” option in both scripts listed above. Before posting a bookmark, the script prompts you to enter a description. The initial value of the description is based on the Yojimbo item comments. If you click “Post”, the bookmark will be posted with the given description but the Yojimbo item comments will not be changed; “Post & Update Comments” will change the item comments to match the entered description. These scripts don’t deal with tags, labels, stars, or other features offered by Yojimbo or Pinboard. These scripts aren’t likely to be very useful if you’re not me. I don’t know exactly what happens if you post the same bookmark to Pinboard twice; I think it’s updated automatically. Some assembly is required. I recommend installing the scripts in the following locations (create the directories if they don’t already exist). Run them with FastScripts or the regular script menu. property _pinboard_script_path : "/Users/anoved/Library/Scripts/Applications/Yojimbo/Post Bookmark to Pinboard.scpt"
Lastly, edit the _API_username and _API_password properties at the top of the Pinboard script to reflect your Pinboard login information. Since the Pinboard API is essentially a clone of the Delicious API, it should be straightforward to modify this script to work with Delicious – but unfortunately I haven’t quite got it working. Don’t hold your breath for an update, but please do share any fixes or improvements. The code to post to Pinboard is derived from this NetNewsWire to Delicious script by Larry and Andrew. My sketchy URL encoding code is lifted from this example at Mac OS X Automation. Posted on Monday, February 15th, 2010. Posted on Sunday, December 13th, 2009. The current version of my Bookmark in Yojimbo script is compatible with the recently-released Yojimbo 2.0. Posted on Wednesday, September 2nd, 2009. Here’s a script to create a new post in MarsEdit from a note selected in Yojimbo. Why use a script when it’s already as easy as copy and paste? Well, maybe your computer is running out of paste. Click here to open the script directly in Script Editor. Save it in ~/Library/Scripts/Applications/Yojimbo and you’re ready to run. Posted on Sunday, May 11th, 2008. I’ve posted a Camino-compatible version of my venerable Bookmark in Yojimbo script. Update: Revised for Camino 1.6. New in Camino 1.6 is the ability to add any script in ~/Library/Scripts/Applications/Camino to the toolbar, so you don’t even need to use a separate script runner. Posted on Tuesday, March 4th, 2008. I use this little script when I want to ensure that every Yojimbo item with a certain tag also has some other tags. For instance, to ensure that every leoben item is also tagged cylon, I run the script, select leoben from the first list of tags that appears, and cylon from the second list. Posted on Thursday, January 17th, 2008. Today Bare Bones Software released Yojimbo 1.5, a significant update to the all-purpose desktop database. Since I’ve written quite a few little scripts for the program, I gave them each a quick test to check whether they worked with Yojimbo 1.5 and Mac OS X 10.4.11. Happily, most of them do. Expanded Comment Fields I’ve posted a new set of nib files compatible with Yojimbo 1.5. I haven’t tried the indispensable widescreen hack yet. Posted on Wednesday, December 5th, 2007.